How and why insect wings evolved is not well understood. 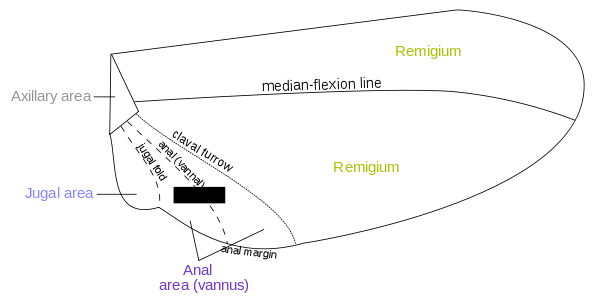 Three main theories on the origins of insect flight are that wings developed from paranotal lobes, extensions of the thoracic terga; that they are modifications of movable abdominal gills as found on aquatic naiads of mayflies; and that insect wings arose from the fusion of pre-existing endite and exite structures each with pre-existing articulation and tracheation. 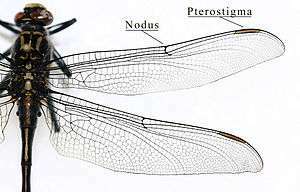 Epicoxal hypothesis:This theory suggested that a possible origin for insect wings might have been the movable abdominal gills found in many aquatic insects, such as on naiads of mayflies. 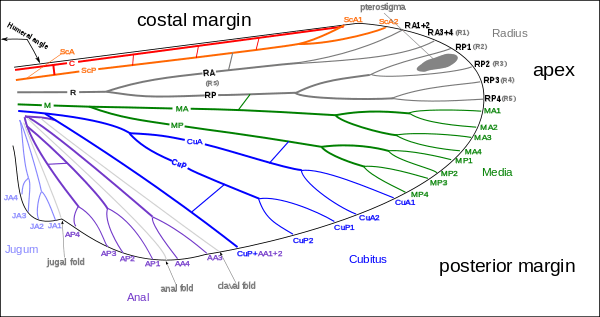 According to this theory these tracheal gills, which started their way as exits of the respiratory system and over time were modified into locomotive purposes, eventually developed into wings. The tracheal gills are equipped with little winglets that perpetually vibrate and have their own tiny straight muscles. Endite-exite hypothesis:The hypothesis with perhaps the strongest evidence is that which stems from the adaptation of endites and exites, appendages on the respective inner and outer aspects of the primitive arthropod limb. 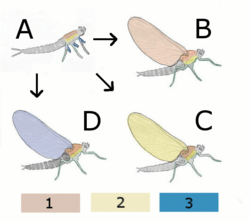 This was advanced by Trueman based on a study by Goldschmidt in 1945 on Drosophila melanogaster, in which a pod variation displayed a mutation transforming normal wings to what was interpreted as a triple-jointed leg arrangement with some additional appendages but lacking the tarsus, where the wing's costal surface normally would be. This mutation was reinterpreted as strong evidence for a dorsal exite and endite fusion, rather than a leg, with the appendages fitting in much better with this hypothesis. 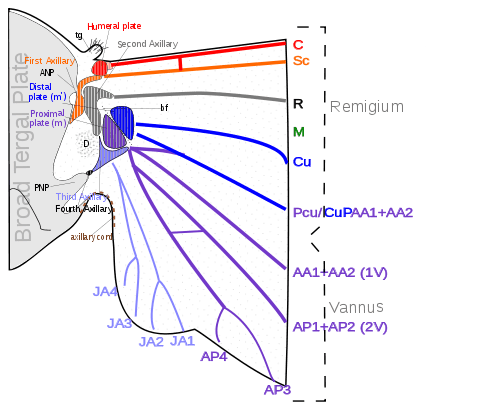 The innervation, articulation and musculature required for the evolution of wings are already present in podomeres. Paranota plus leg gene recruitment hypothesis:The fossil larvae of Coxoplectoptera provided important new clues to the disputed question of the evolutionary origin of insect wings. Before the larvae fossil discovery the paranotal-hypothesis and the leg-exite-hypothesis have been considered as incompatible alternative explanations, which have both been supported by a set of evidences from the fossil record, comparative morphology, developmental biology and genetics. The expression of leg genes in the ontogeny of the insect wing has been universally considered as conclusive evidence in favour of the leg-exite-hypothesis, which proposes that insect wings are derived from mobile leg appendages (exites). However, the larvae of Coxoplectoptera show that the abdominal gills of mayflies and their ancestors, which are generally considered as corresponding structures to insect wings, articulated within the dorsal tergite plates. This cannot be seen in modern mayfly larvae, because their abdominal tergites and sternites are fused to rings, without any traces left even in embryonic development. If larval gills and wings are corresponding ("serial homologous") structures and thus share the same evolutionary origin, the new results from Coxoplectoptera demonstrate that also wings are of tergal origin, as proposed by the classical paranotal-hypothesis. 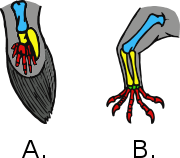 Staniczek, Bechly & Godunko (2011) therefore suggested a new hypothesis that could reconcile the apparently conflicting evidence from paleontology and developmental genetics: wings first originated as stiff outgrowths of tergal plates (paranota), and only later in evolution became mobile, articulated appendages through secondary recruiting of leg genes. Suggestions have been made that wings may have evolved initially for sailing on the surface of water as seen in some stoneflies. 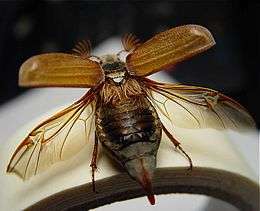 An alternative idea is that it drives from directed aerial gliding descent—a preflight phenomena found in some apterygote, a wingless sister taxa to the winged insects. 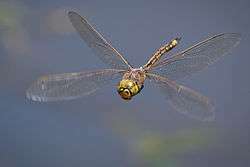 The earliest fliers were similar to dragonflies with two sets of wings, direct flight muscles, and no ability to fold their wings over their abdomens. 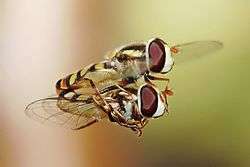 Most insects today, which evolved from those first fliers, have simplified to either one pair of wings or two pairs functioning as a single pair and using a system of indirect flight muscles. 1 2 3 4 5 6 Chapman, R.F. (1998). The Insects: Structure and function (4th ed.). Cambridge, New York: Cambridge University Press. ISBN 0-521-57048-4. 1 2 Gilliott, Cedric (August 1995). Entomology (2 ed.). Springer-Verlag New York, LLC. ISBN 0-306-44967-6. 1 2 3 4 5 Meyer, John R. (5 January 2007). "External Anatomy: WINGS". Department of Entomology, North Carolina State University. Retrieved 2011-03-21. 1 2 3 4 Gullan, P. J.; Cranston, P. S. (2004). The insects: an outline of entomology. UK: Blackwell Publishing. ISBN 1-4051-1113-5. 1 2 3 4 5 6 7 8 9 10 11 12 13 14 15 Snodgrass, R. E. (December 1993). 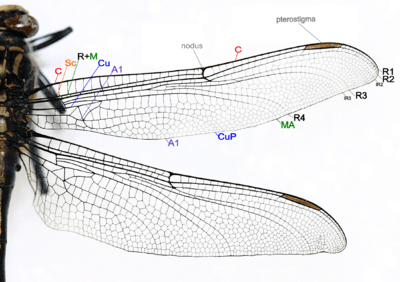 Principles of Insect Morphology. Cornell Univ Press. ISBN 0-8014-8125-2. ↑ Spieth, HT (1932). 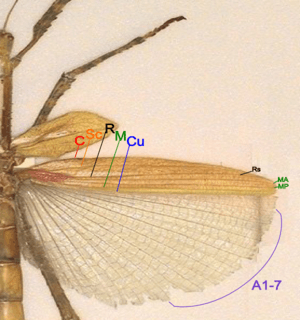 "A New Method of Studying the Wing Veins of the Mayflies and Some Results Therefrom (Ephemerida)" (PDF). Entomological News. 1 2 Knospe, Carl R. (Fall 1998). 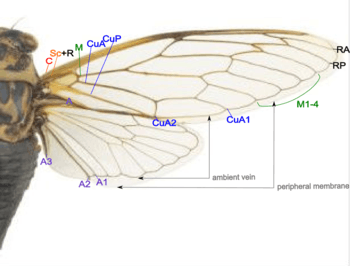 "Insect Flight Mechanisms: Anatomy and Kinematics" (PDF). Mechanical and Aerospace Engineering, University of Virginia. ↑ Weis-Fogh, T (July 1963). 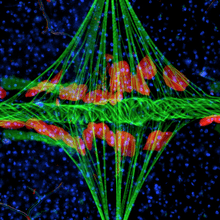 "Diffusion In Insect Wing Muscle, The Most Active Tissue Known" (PDF). J Exp Biol. 41: 229–256. PMID 14187297. ↑ Tiegs, O. W. (February 1954). "The Flight Muscles of Insects-Their Anatomy and Histology; with Some Observations on the Structure of Striated Muscle in General". Philosophical Transactions of the Royal Society of London. Series B, Biological Sciences. 238 (656): 221–348. Bibcode:1955RSPTB.238..221T. doi:10.1098/rstb.1955.0001. JSTOR 3739600. 1 2 Chapman, A. D. (2006). Numbers of living species in Australia and the World. Canberra: Australian Biological Resources Study. pp. 60pp. ISBN 978-0-642-56850-2. 1 2 Wang, Z. Jane (2005). 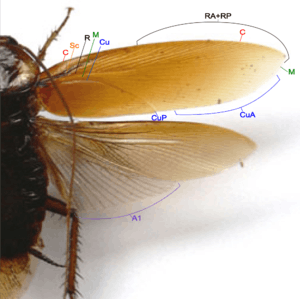 "DISSECTING INSECT FLIGHT" (pdf). Annual Review of Fluid Mechanics. Annual Reviews. 37: 183. Bibcode:2005AnRFM..37..183W. doi:10.1146/annurev.fluid.36.050802.121940. 1 2 Sane, Sanjay P. (2003). "The aerodynamics of insect flight" (PDF). The Journal of Experimental Biology. 206 (23): 4191–4208. doi:10.1242/jeb.00663. PMID 14581590. ↑ Davidovits, Paul (2008). Physics in Biology and Medicine. Academic Press. pp. 78–79. ISBN 978-0-12-369411-9. ↑ Yanoviak, S. P.; Munk, Y.; Kaspari, M.; Dudley, R. (2010). "Aerial manoeuvrability in wingless gliding ants (Cephalotes atratus)". Proceedings of the Royal Society B: Biological Sciences. 277 (1691): 2199. doi:10.1098/rspb.2010.0170. 1 2 3 4 5 6 7 8 9 Grimaldi, David; Engel, Michael S. (2005). Evolution of the Insects. New York, NY: Cambridge University Press. 1 2 3 4 5 Powell, Jerry A. (2009). "Coleoptera". In Resh, Vincent H.; Cardé, Ring T. Encyclopedia of Insects (2 (illustrated) ed.). Academic Press. p. 1132. ISBN 978-0-12-374144-8. ↑ Michael S. Engel; David A. Grimaldi (2004). "New light shed on the oldest insect". Nature. 427 (6975): 627–630. Bibcode:2004Natur.427..627E. doi:10.1038/nature02291. PMID 14961119. 1 2 Riek EF Kukalova-Peck J (1984). "A new interpretation of dragonfly wing venation based on early Upper Carboniferous fossils from Argentina (Insecta: Odonatoida and basic character states in Pterygote wings.)". Can. J. Zool. 62 (6): 1150–1160. doi:10.1139/z84-166. ↑ Wakeling JM Ellington CP (1997). "Dragonfly flight III lift and power requirements". Journal of Experimental Biology. 200 (Pt 3): 583–600 (589). PMID 9318294. ↑ Matsuda R (1970). 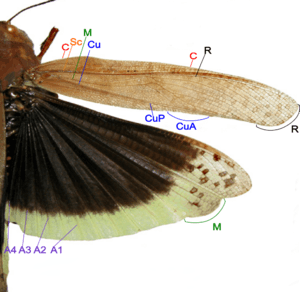 "Morphology and evolution of the insect thorax". Mem. Ent. Soc. Can. 76 (76): 1–431. doi:10.4039/entm10276fv. ↑ Adrian L. R. Thomas; R. Åke Norberg (1996). "Skimming the surface — the origin of flight in insects?". Trends in Ecology & Evolution. 11 (5): 187–188. doi:10.1016/0169-5347(96)30022-0. ↑ Yanoviak SP, Kaspari M, Dudley R (2009). "Gliding hexapods and the origins of insect aerial behaviour". Biology Letters. 5 (4): 510–2. doi:10.1098/rsbl.2009.0029. PMC 2781901 . PMID 19324632. 1 2 3 4 H. Comstock, Henry (1918). The Wings of Insects. Ithaca, NY: The Comstack Publishing Company. 1 2 3 "Insect Wings in General". Aerodynamics of Insects. Cislunar Aerospace. 1997. Retrieved March 28, 2011. 1 2 3 4 5 6 7 8 9 10 Chew, Peter (May 9, 2009). "Insect Wings". Brisbane Insects and Spiders. Retrieved 2011-03-21. 1 2 Scoble (1995). Section Scales, (pp 63 – 66). ↑ Vukusic, P. (2006). "Structural color in Lepidoptera" (PDF). Current Biology. 16 (16): R621–3. doi:10.1016/j.cub.2006.07.040. PMID 16920604. Retrieved 11 November 2010. ↑ Trueman, John W. H.; Richard J. Rowe (16 October 2009). "Odonata. Dragonflies and damselflies.". Tolweb.org. Retrieved 2011-03-21. ↑ Abe T., Bignell D.E; Higashi M (2000). Termites: evolution, sociality, symbioses, ecology, ecolab. Kluwer academic publishers. ISBN 0-7923-6361-2. ↑ "Termite". Texas AgriLife Extension Service.